I love those 'out of the first floor window' shots! I would love to get out there girls, the Dandelions are taking over! Beautiful vista,Annella..so lush and green..after all your rain ! done it the world of good,really..I have ordered some sunshine for you soon,..I would hate you to be stuck inside,cleaning .Lol. How colourful is that?! Lovely Annella . . .
That looks so beautiful Annie. So bright and colourful, in the thumbnail it actually looks like the sun is shining! ....you really are a very clever lady to get it looking so colourful using mostly shrubs. It is very impressive...should write a book about how you do it! lol Pimps...you been at the bevvy? Only joking, but I did say to Lulu the other day that it's truly generous soul that can appreciate a dandelion seed head!! Not sure about your area,Annella,but think we are getting it. :o(..I hope you don't,while you are off work..so annoying.. grrr.. I can see all your points about Dandelions Pimp and may have to live with their beauty if this weather carries on Lol....(laughing franticaly!) Thanks for trying Bloomer :o)) And Karen you have noticed the lack of flowers, good thing the shrubs work hard!! Thank you for your lovely comment. "Apparently, in Japanese gardening, flowers are not encouraged"
If you google 'Japanese Garden' images you will see that there are very few blossoms in the photos. Most of the colour seems to come from Acers and the odd azalea etc. I must admit, I really adore Japanese gardens...they are stunning and so peaceful! Well this year my favourite plant could be 'Taraxacum officinale' Lol! 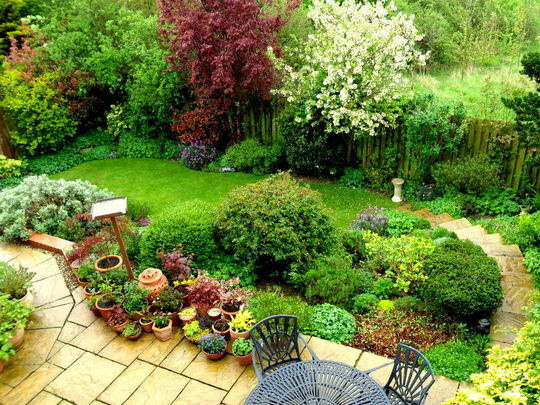 Your garden is so colourful and I would absolutely be over the moon if mine looked as good as this. I love Japanese Gardens too, Karen, and there are many different ones for different moods, aren't there? I guess the traditional kind are mainly pebbles, sand, rocks and water, with maybe an Acer or two - lovely to look at but not to live in. To see the blossom at Cherry Tree time in Japan would be amazing!! Gorgeous Annella and it makes my garden look a tip - so well kept and beautifully planted - very jealous !!! A lot of the Japanese are now taking to our kind of gardens, we were told this when they filmed our garden, they want to have traditional english borders, weird isn't it? Annella as usual whatever the weather your garden looks wonderful, the colours, and textures are all there. a view like that is worth taking time out for! how long have you had that garden? there must be an *awful* lot of work gone into it - and an equal amount of love, too. lol Karen...Yours is a SPECIAL japanese plant though. aren't those the new steps that you put in last year? how are they keeping up? Lol Karen...SumoXNinja!!! Fran I moved in here 11 years ago tomorrow. It was a bare then just fence to fence grass. Both sets of steps have been there from the beginning with no problems really. shee, that's a heck of a result for "only" eleven years! shows how much work you've put in. must be someone else who put in, or replaced, a set of steps similar to yours. Yes I remember reading that Fran, can't think who it was now though. The trees all came home from garden centres in my little Corsa 11 years ago Lol! lol I can't remember either! I'm sure someone will remind us, if not the person themself. Do you have a blog on "then and now" and the stages in between? it'd be fascinating to see the blank canvas, and how you painted it. There are two Fran, part 1 is on page 4 of my blogs and part 2 is on page 1. Both called Before and After. Heavy rain at the minute Karen.....home now and the hoover is coming out of the closet! It's ok, needs to be done......not come out yet though 'cos I'm on here! I wonder you get any cleaning done when you can sit and look at a view like this. A beautiful garden. I'm seeking inspiration and this is now on my list - the vacuum will still be there tomorrow! Annie, I know this photo is 2 years old, but I just had to comment on how lovely your garden looks.